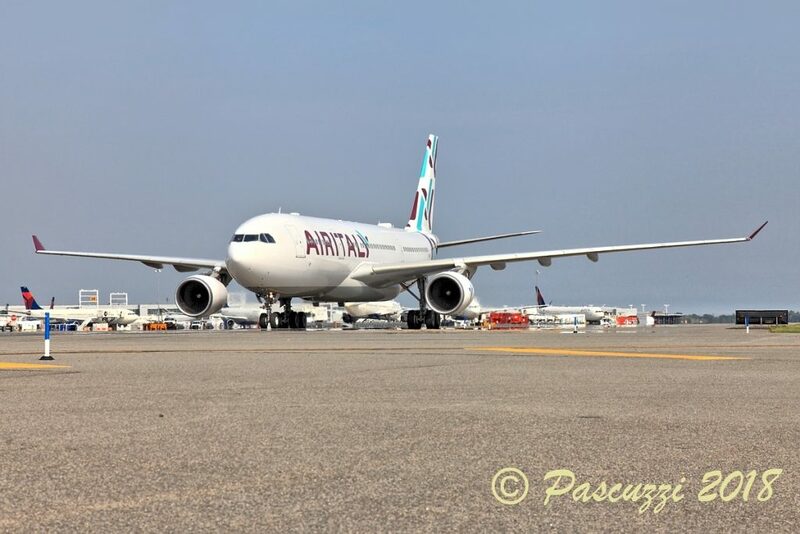 In a major step forward for the reincarnated Italian airline Air Italy, the airline flew its first ever flight in its new branding from its home base at Milan’s Malpensa Airport to New York’s JFK Airport. 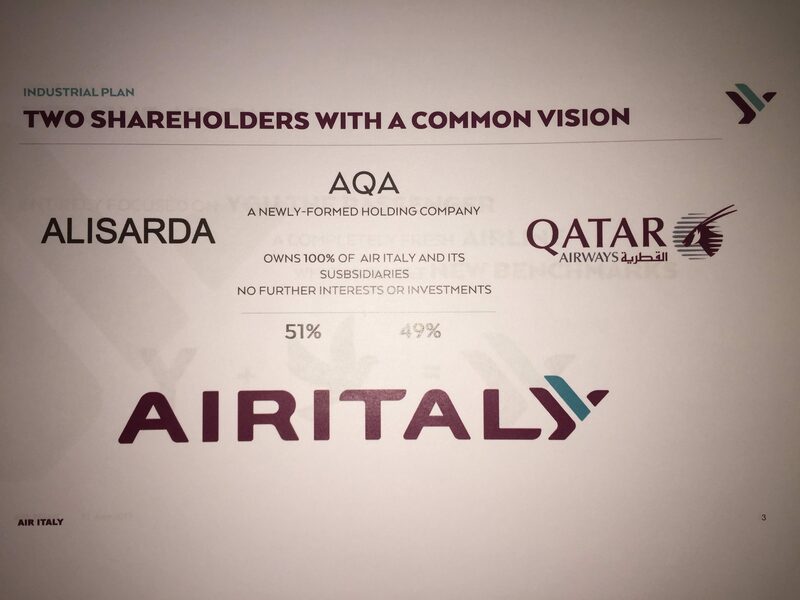 The joint venture between Alisarda, the controlling shareholder, and Qatar Airways aims to displace Alitalia, Italy’s current national carrier that has been plagued with financial problems, as the airline of Italy. 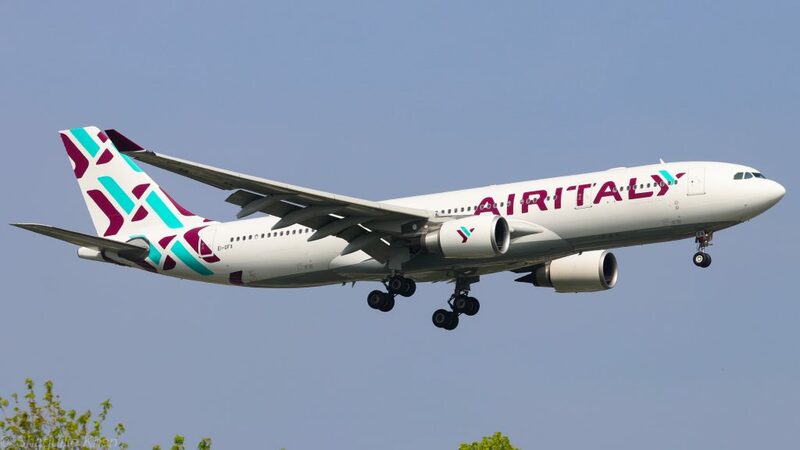 Operating an Air Italy branded Airbus A330-200 from Qatar Airways, which has a 49 percent stake in the airline, ISS901 departed Malpensa shortly before 2:30 p.m. local time, flying nearly 9 hours before landing at JFK Airport at 4:00 p.m. The flight to New York was delayed an hour due to a sick passenger but went smoothly other than that. Following its arrival, the A330 taxied to Terminal 1, which the airline’s predecessor, Meridiana, had utilized when it operated service to Italy using its Boeing 767-300 aircraft. Back then, the airline was a seasonal alternative to Alitalia, serving cities in southern Italy and Sicily such as Naples and Palermo. 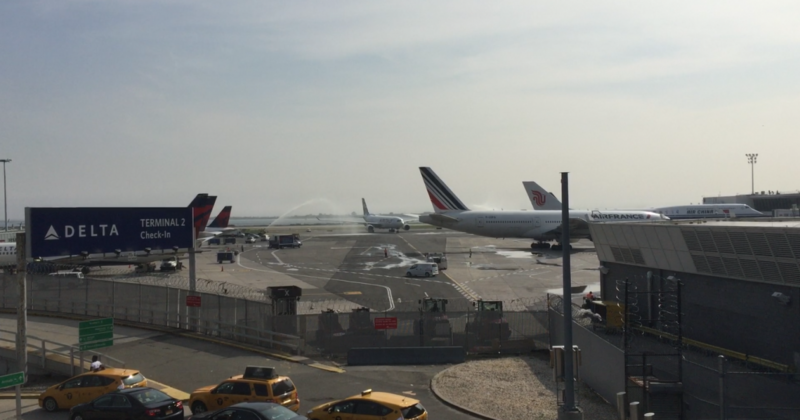 Returning triumphantly to JFK, the white, purple and teal aircraft entered the ramp with the congratulatory water cannon salute to christen the airline’s arrival to New York. 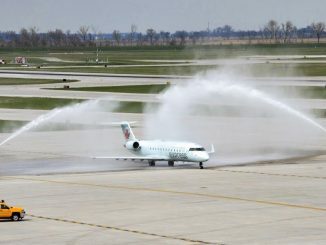 Out of the five flights operating the Milan-New York route today, all eyes were on this one as its arrival marked the beginning of daily service between the two cities on the new airline. Following its arrival, the airline hosted various media at Air Italy’s check-in counter in Terminal 1 with Alisarda CEO Marco Rigotti, Air Italy’s Vice President of Operations, The Americas Dino Favano, Executive Director of JFK’s Terminal 1 Steve Rowland, Port Authority’s Deputy General Manager John Selden and members of the Italian Federation. The check-in area was still being set up as we arrived, with some signage and informational placards still wrapped up. Nonetheless, passengers were already queuing up for the return flight to Milan, the inaugural flight ISS902, departing later in the day. 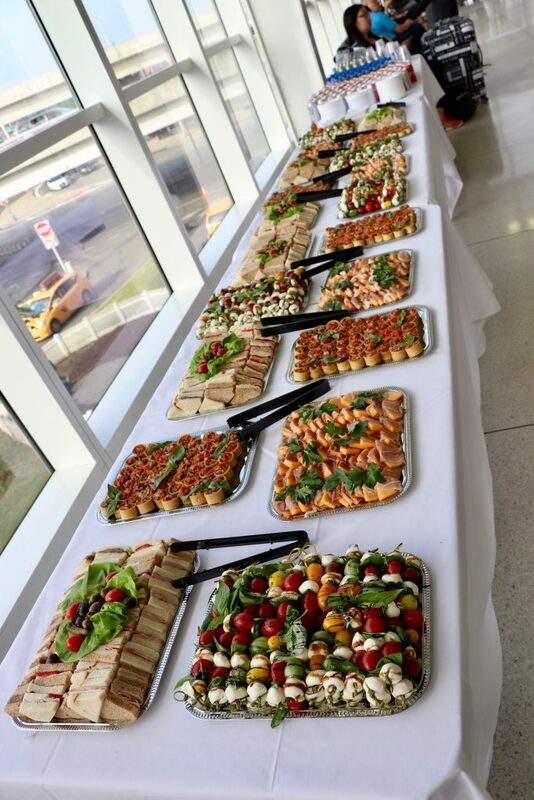 Air Italy passengers who had arrived at the airport early was also given access to a buffet of Italian antipasto, sandwiches and drinks. 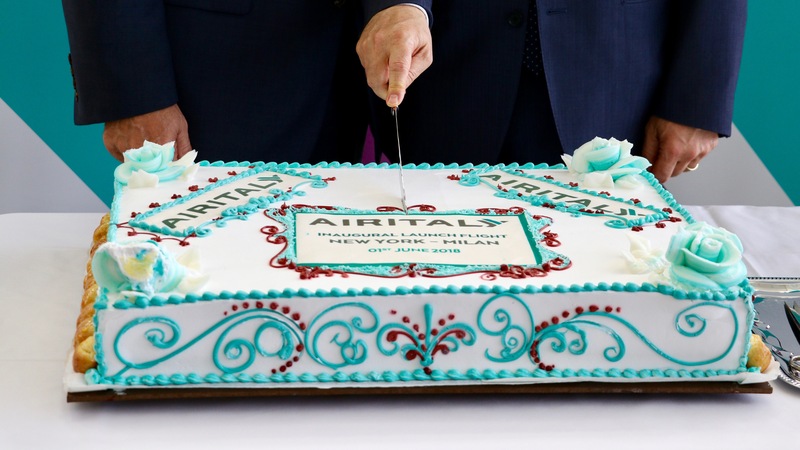 The airline had ordered a cake for the event, which guests and passengers were able to enjoy following the event. 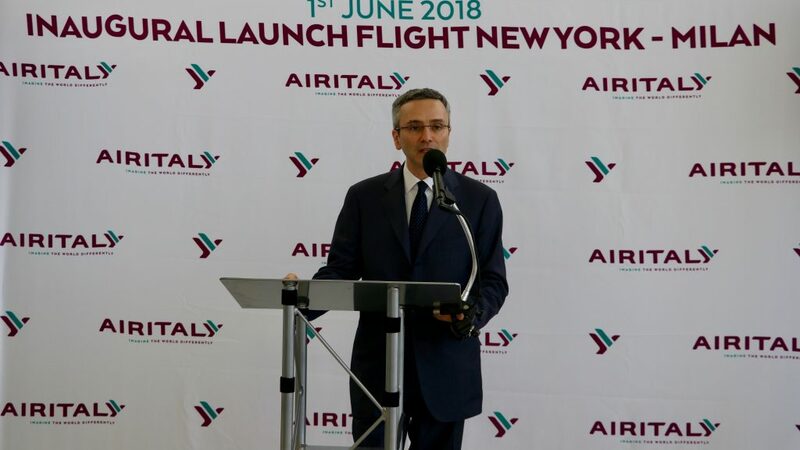 First to speak was Air Italy’s Vice President of Operations, The Americas Dino Favano who started off by thanking everybody for attending and was happy that the dream of a new Air Italy had finally come to reality. 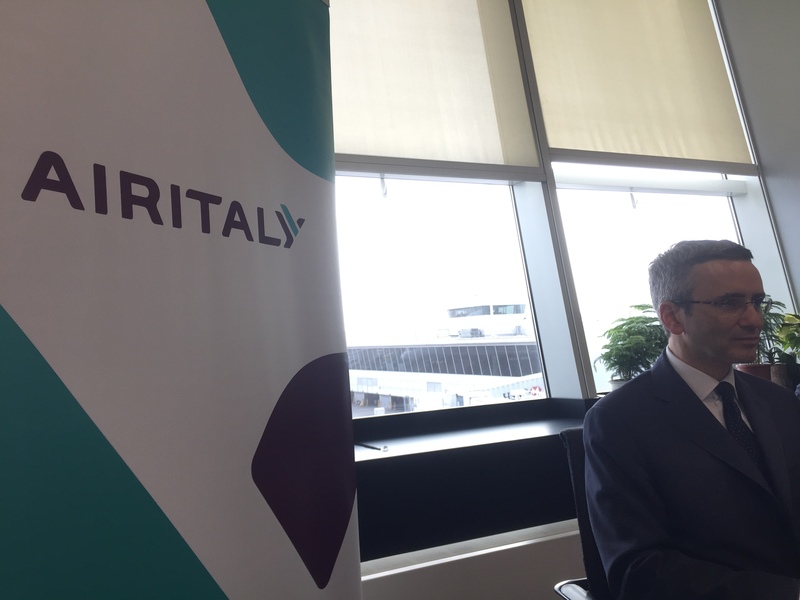 Favano remarked at how Meridiana, Air Italy’s predecessor, had faithfully served Italy for 13 years and now it’s time to Air Italy to continue the tradition. Favano then introduced the guests and speakers for the event and would be the emcee for the afternoon. After he finished his speech, he repeated it in Italian for Italian speakers. 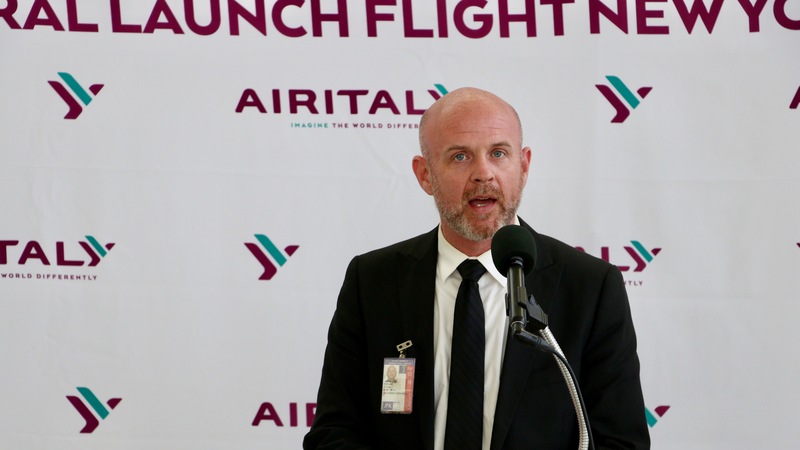 Next to the podium was Alisarda CEO Marco Rigotti, who had just flown in the inaugural from Milan and started off by thanking JFK Airport and the Port Authority of New York and New Jersey. 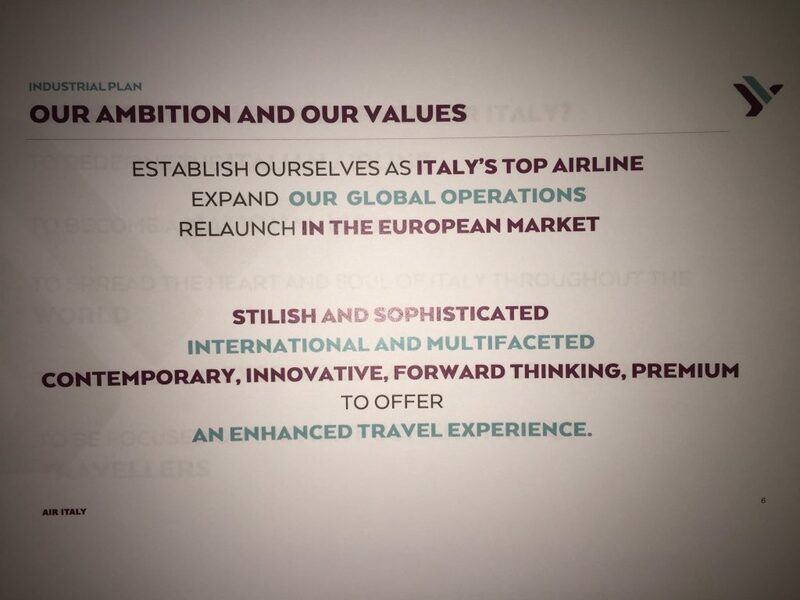 The CEO stressed the importance of a being a new option for Italians and those visiting Italy who deserve a modern, stylish and sophisticated airline, which he believes Alitalia isn’t doing. 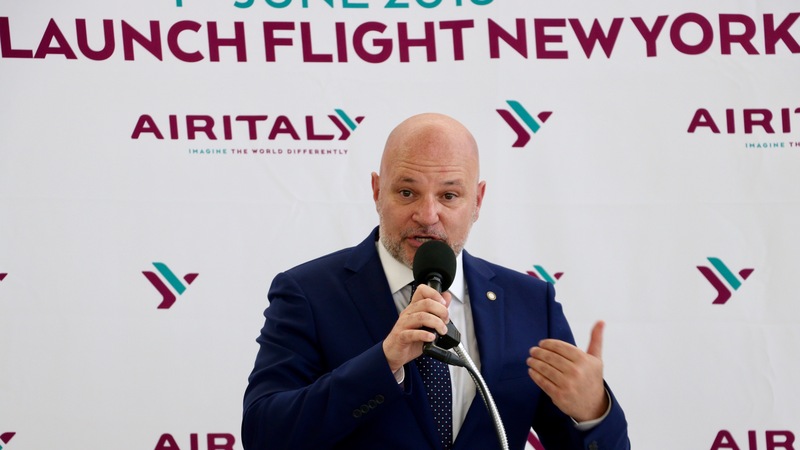 Rigotti stated the ultimate goal for the airline is to be the new benchmark for Italy and the airline understands the demands and requests of the traveling public, which he believes will be surprised by the service offered onboard. 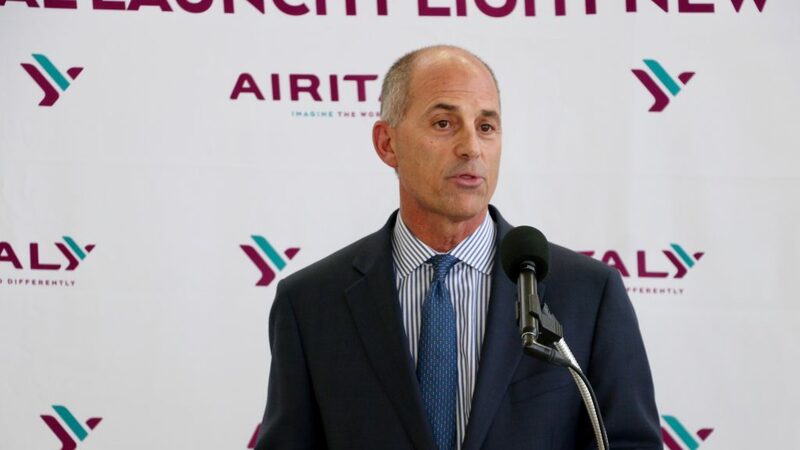 Rigotti then outlined the future for the airline, which involves route additions and aircraft deliveries while the airline continues to grow its initial route network. The A330 that flew the inaugural flight, EI-GFX, is the only widebody aircraft in operation. 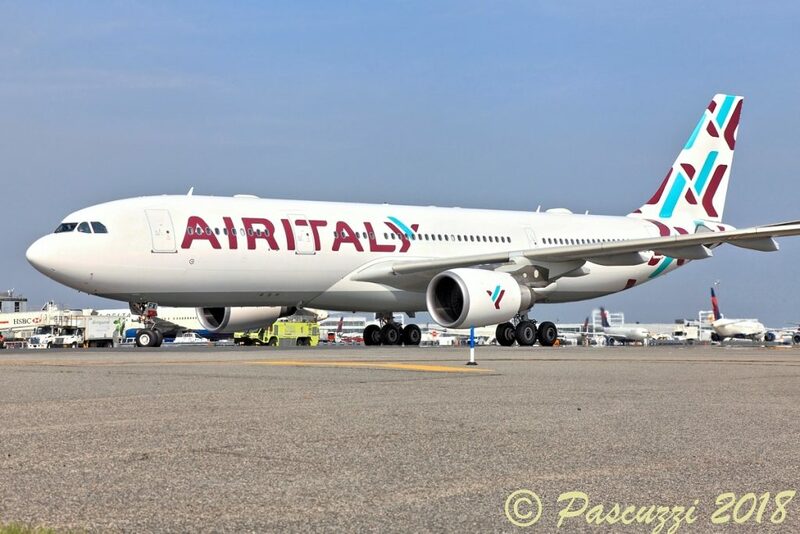 Its second A330 is currently in Milan going through tests before it launches the four-times-weekly service to Miami on June 8. 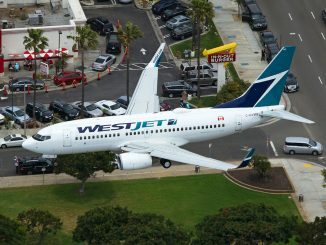 For the next 2 years, the airline will be receiving the remainder of its 20 Boeing 737 MAX 8 orders, the first of which it took delivery of last month at a ceremony in Seattle. 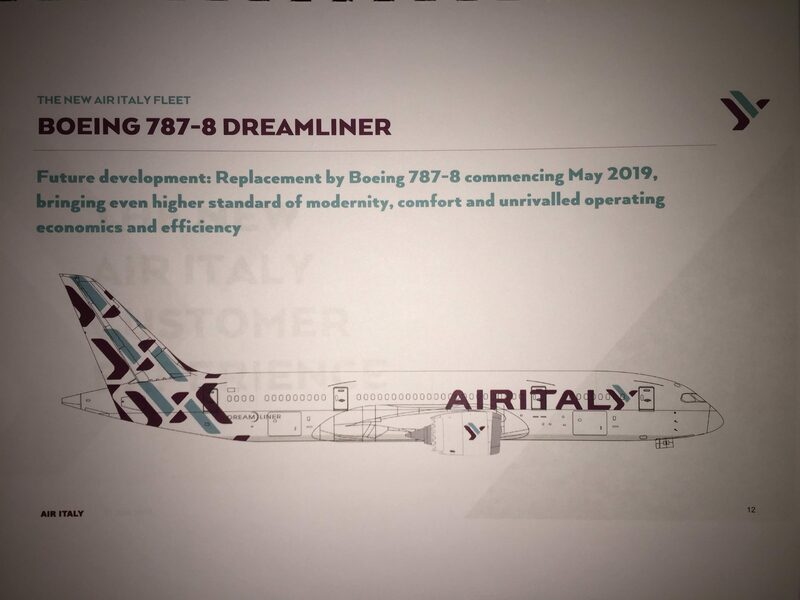 Next year, the airline will begin receiving its Boeing 787 Dreamliner aircraft fresh from Boeing, which will allow the airline to further grow its long-haul network with an “even higher standard of modernity and comfort,” according to Rigotti. 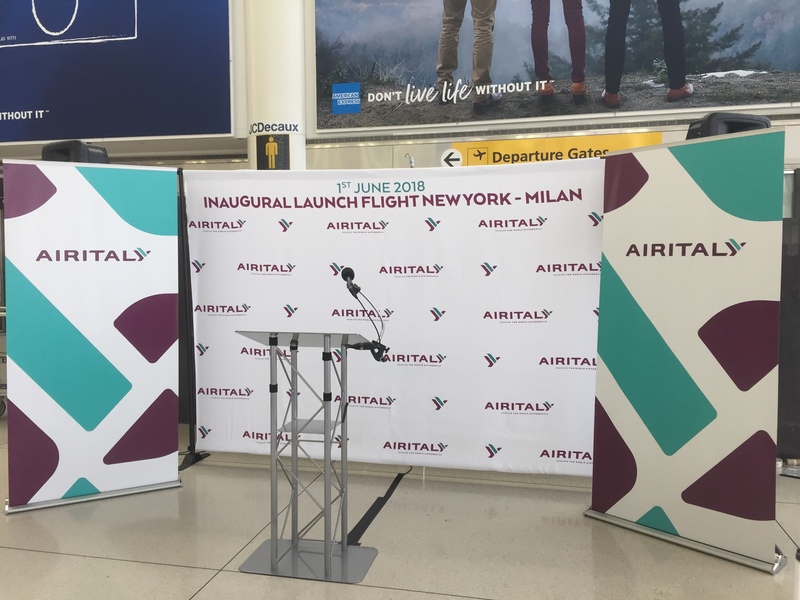 Rigotti then thanked the people of Air Italy that worked hard to make this day happen and welcomed Port Authority’s Deputy General Manager John Seldon. 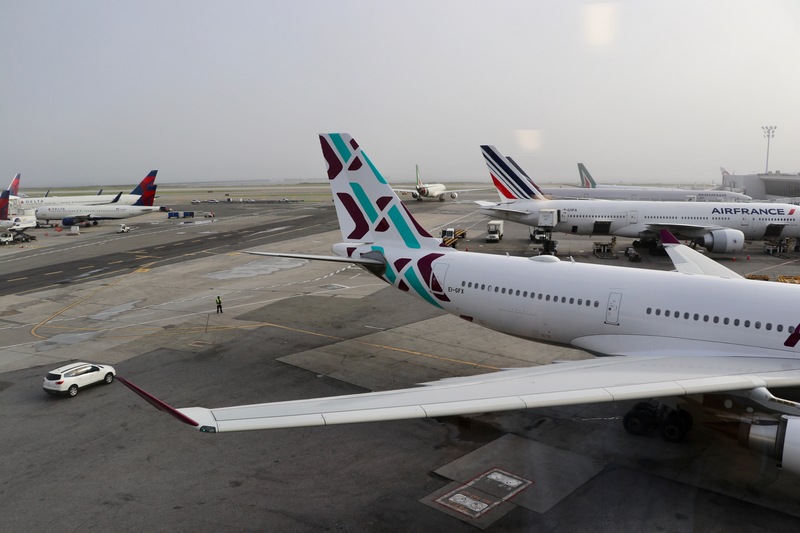 Seldon began by welcoming Air Italy to JFK for the inaugural flight, calling the airline a “new airline with great service,” and remarking on Meridiana’s 13-year history with the airport when it started flying to JFK in 2005. One of the key points of his speech was the transformation of JFK Airport. 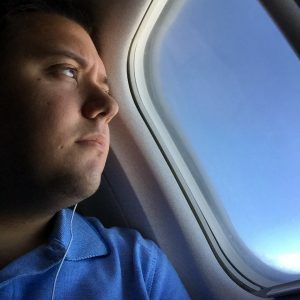 With a $10 billion budget and the help of New York Governor Andrew Cuomo, the Port Authority wants to bring together JFK’s terminals, which are currently isolated from each other except for Terminals 4 and 2, and create 3 main connected buildings. Up next was the Executive Director of Terminal 1 Steve Rowland, who worked with Air Italy and Meridiana since 2005. 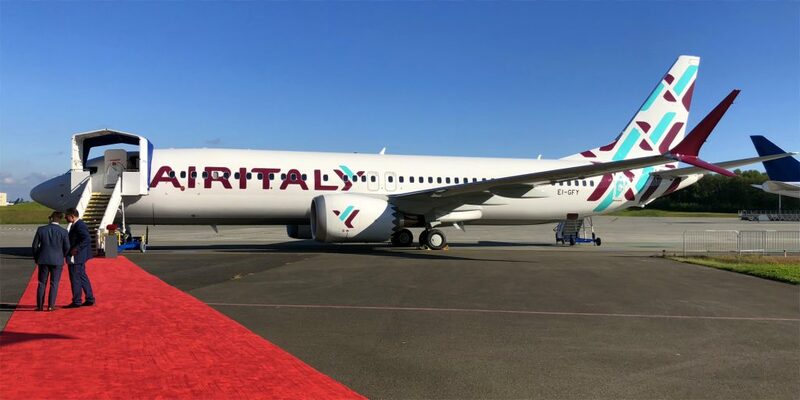 Rowland welcomed the new Air Italy back to the terminal following its predecessor’s absence since last summer when its service to Southern Italy ended for the season at the end of the summer before the rebranding was announced. It was a special occasion for Rowland, as the terminal is celebrating its 20th anniversary since Lufthansa, Korean Air, Air France and Japan Airlines came together to build and operate the terminal under the Terminal One Group. 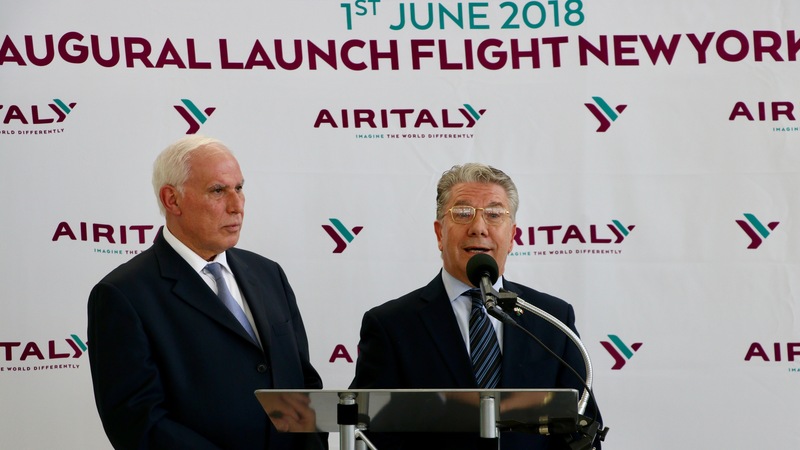 Rowland then stated that this is a new chapter for the terminal with Air Italy’s arrival and shows the continuation of successful airlines operating at the terminal. 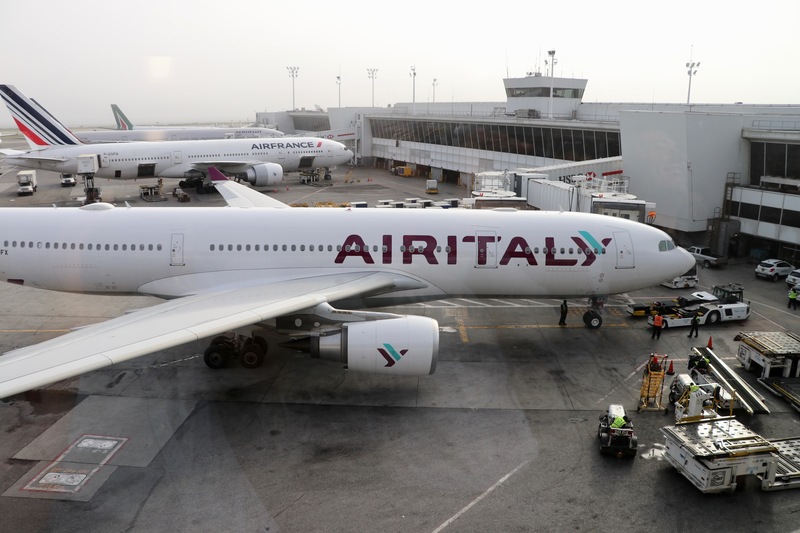 Finally, the Chairman and the President of the Italian Federation, a local Italian-American organization, both thanked Air Italy for their continued support of the organization, stating that the airline is vital to their success. After the remarks, Mr. Rigotti and Mr. Seldon cut the ceremonial ribbon cutting, officially inaugurating service from New York to Milan, and cut the cake that Air Italy had made for the event. 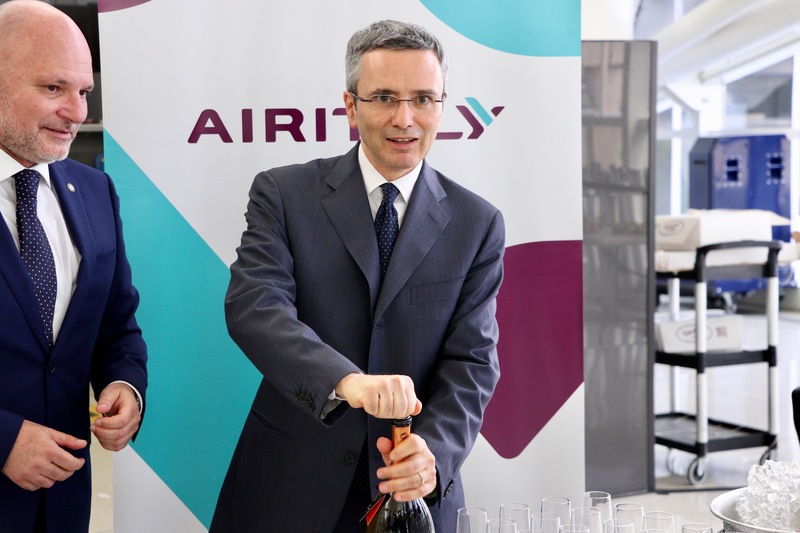 Mr. Rigotti also popped a bottle of Italian champagne to celebrate the event, with a lucky passenger standing halfway across the terminal catching the cork. Press were then invited to a press conference with Mr. Rigotti in the Terminal 1 back offices. 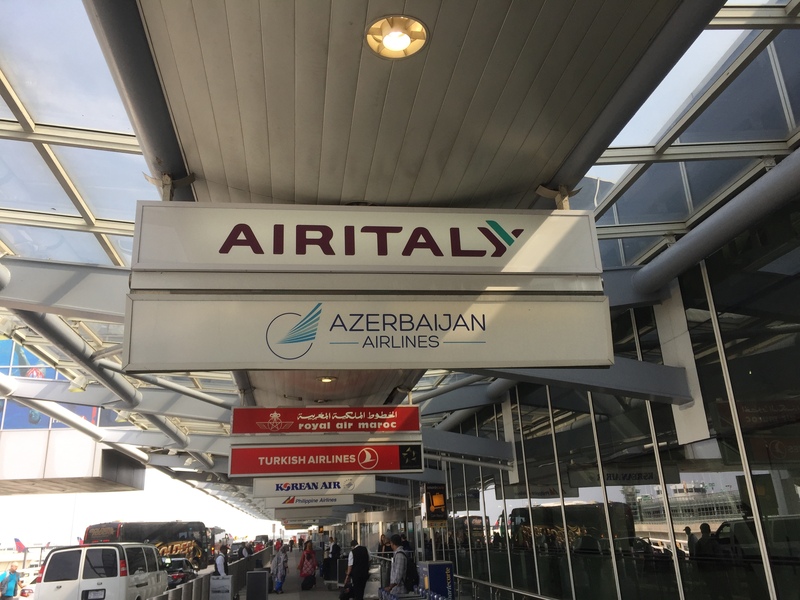 The first question asked was why Air Italy had chosen Milan as a hub when the airline’s predecessor Meridiana had operating mainly to Southern Italy. Rigotti had answered by stating Milan’s importance to Italy, calling it one of the richest regions in the country, but was underserved from a connection point of view. 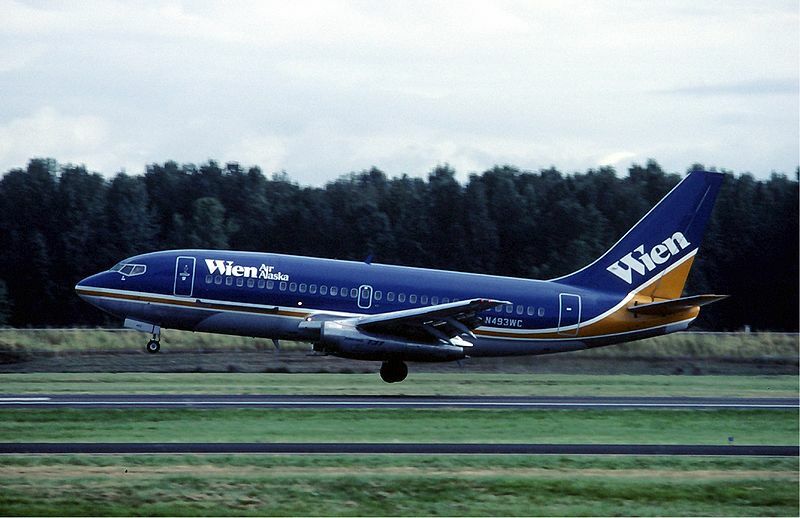 Rigotti stressed that while Milan was its hub, its main purpose was as a connection hub for passengers to transit through either to other points in Italy or the airline’s destinations in Asia such as Bangkok and Mumbai. 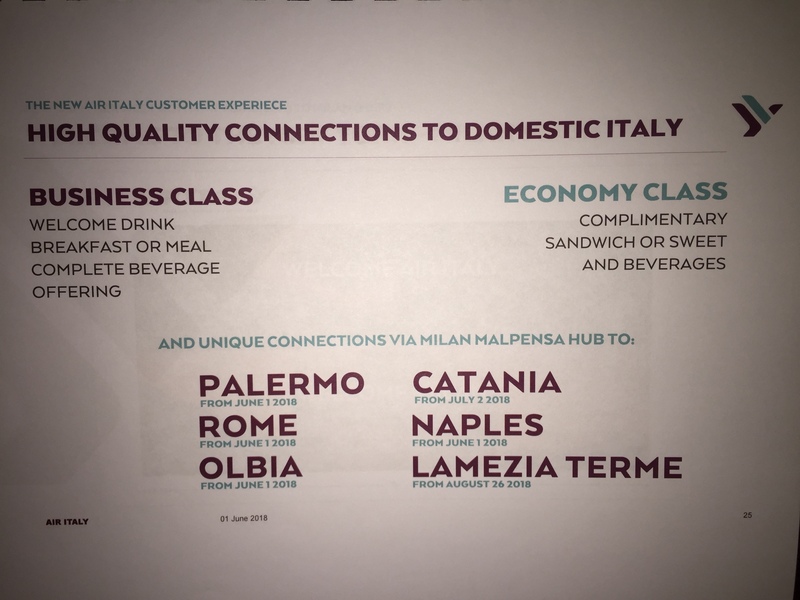 Although other airlines such as Alitalia, American Airlines, Delta Air Lines and Emirates also serve the route, those airlines provide few connection options through Milan, which Air Italy hopes to capitalize on. Furthermore, Milan is a strong connection point for cargo, which Rigotti said was just as important as passenger traffic. The airline hopes to expand its cargo customers, which its routes to Asia will help it do, and already transported cargo on the flight to New York. However, the airline doesn’t have plans to expand to other Italian cities such as Rome to build new hubs, but it will operate some point-to-point routes. The next question regarding the inaugural flight, specifically its load factors. 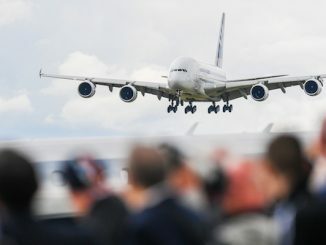 Rigotti stated that the load factor for the first flight was “scary because it was above 95 percent.” Although he doesn’t believe that will remain forever, it is projected throughout June and will be comparable on the Milan-Miami route because of fewer competitors. Rigotti also stated that there was a positive customer response, even on the first day of operations. AirlineGeeks was then able to ask Mr. Rigotti about the influence of Qatar Airways leading up to the first flight and a potential stopover program for Milan. Regarding Qatar Airways, Rigotti stated that Qatar Airways, under the direction of CEO His Excellency, Mr. Akbar Al-Bakar, has been really helpful and inspiring not just because of the financial assistance, but because of the shared vision that the two company’s share. Qatar Airways is an award-winning airline largely because of Al-Bakar, which is why Rigotti believes the partnership is so beneficial. There’s also a mutual understanding between the two that allows Air Italy to operate without interference, despite being the minority shareholder with 49 percent owned by Qatar Airways. According to Rigotti, Qatar doesn’t dictate strategy and it doesn’t want to. Rigotti stated that the airline has complete autonomy and is independent from Qatar Airways. In fact, the airline will even be competing with the airline for some routes. In addition, the airline has no plans for a codeshare agreement with Qatar Airways on flights to the U.S. The next question from AirlineGeeks was whether or not the airline plans to implement a stopover program similar to Qatar Airways or Icelandair where passengers can stay in Milan for a few days free of charge. 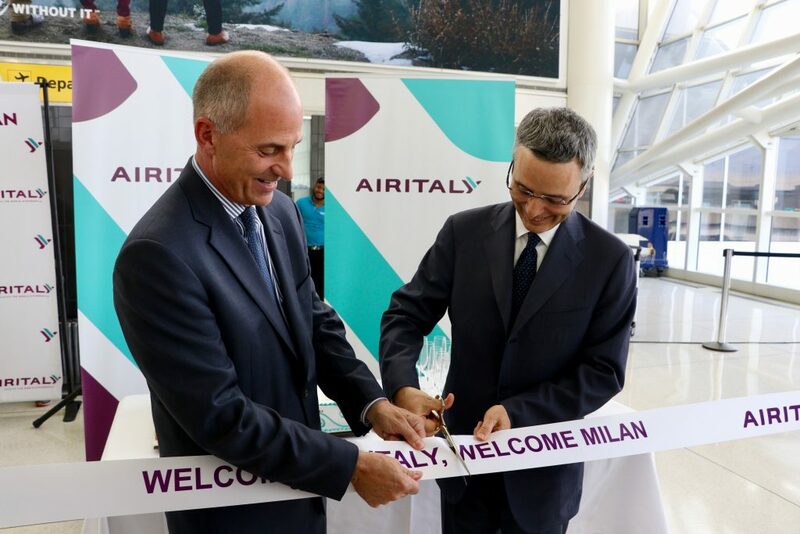 While Rigotti admitted that the airline doesn’t currently have one, he seemed open to the idea of starting one in the future since Milan and its surrounding area is becoming a popular tourist destination. Once the airline starts flying to more destinations in Asia in the fall such as Mumbai, Bangkok and two other long-haul destinations that Rigotti mentioned the airline will be announcing soon, it might be feasible. For now, however, Milan’s primary purpose is as a connection hub to points within Italy. 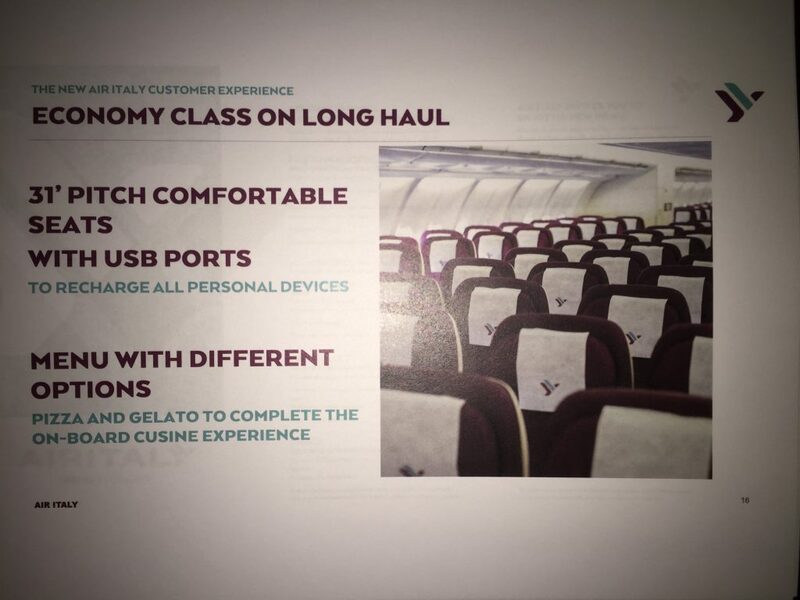 When asked about the key features that set Air Italy apart, Rigotti pointed to two things, the service and the entertainment options. With the service, Rigotti firmly believes that it will set the airline apart from others and will be carried out mainly by the flight attendants. Rigotti claims the flight attendants will be motivated, give personalized service and always have positive attitudes. Service is what will make the airline successful, Rigotti believes. 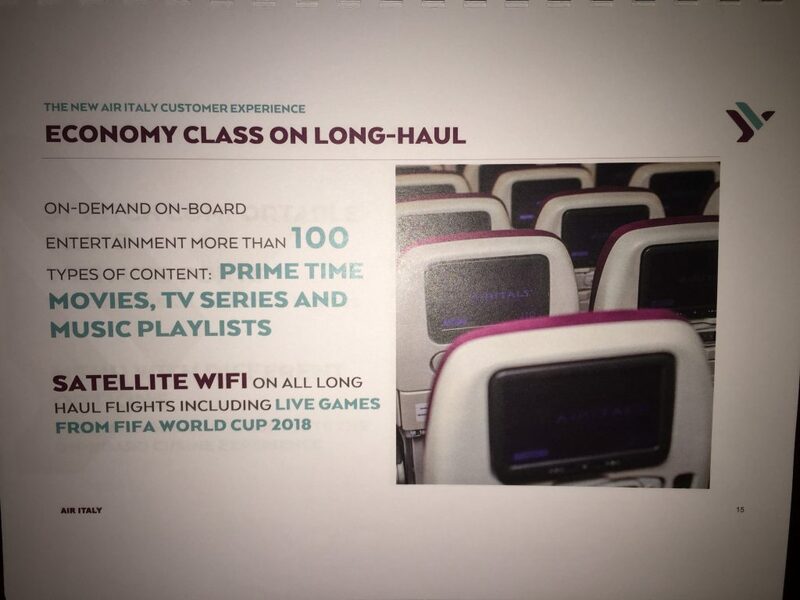 Regarding entertainment options, Rigotti boasted the airline’s in-flight entertainment (IFE) system at every seat on the widebody aircraft, in-flight WiFi, USB ports, power outlets for laptops and live television. Although Rigotti doesn’t use those features personally, he knows that passengers demand it when they fly. 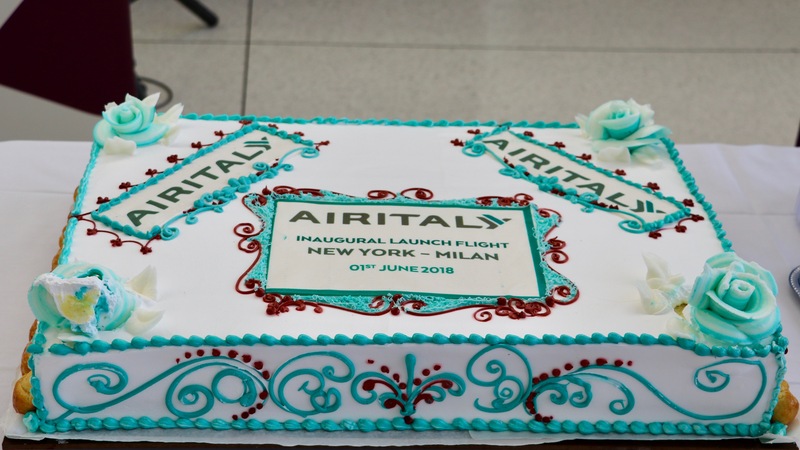 Rigotti also mentioned that the seats are very comfortable and feature above-average pitch at 31 inches and that passengers will be happy with the new food options served on board which will include pizza and gelato. 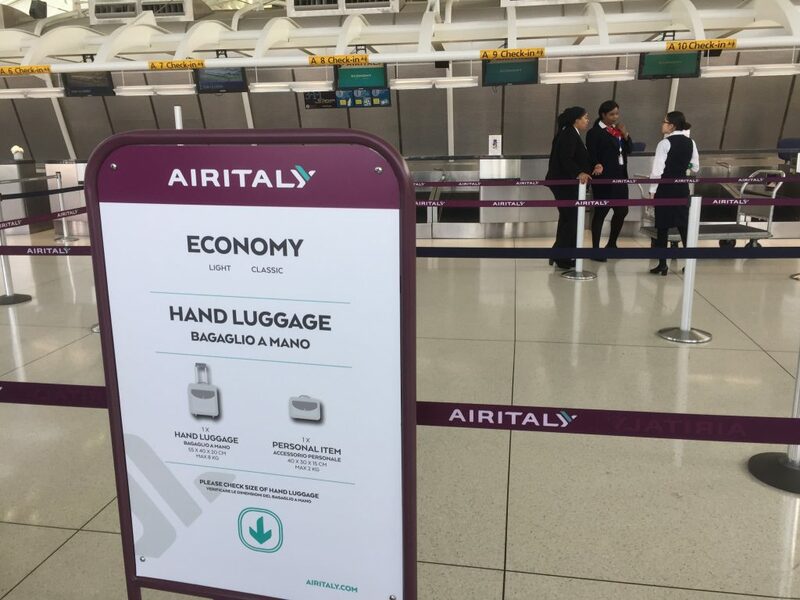 Lastly, when asked whether Air Italy will institute its own frequent flyer program, Rigotti stated that Air Italy is happy with its status in the Avios frequent flyer program that is utilized by IAG airlines. 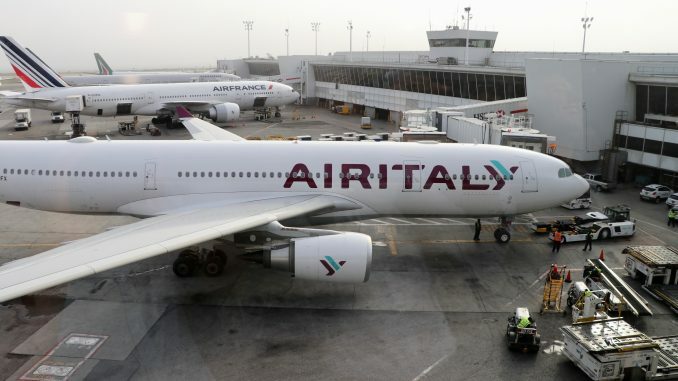 While the route is a popular connection between New York and Italy, Air Italy choosing it as its inaugural route also serves to send a message to Air Italy’s competition, Alitalia and Qatar Airways’ competition, Emirates Airline. Alitalia operates the route with an Airbus A330, just like Air Italy will until the airline receives its Boeing 787 Dreamliners from Boeing, and Emirates operates its flagship Airbus A380. 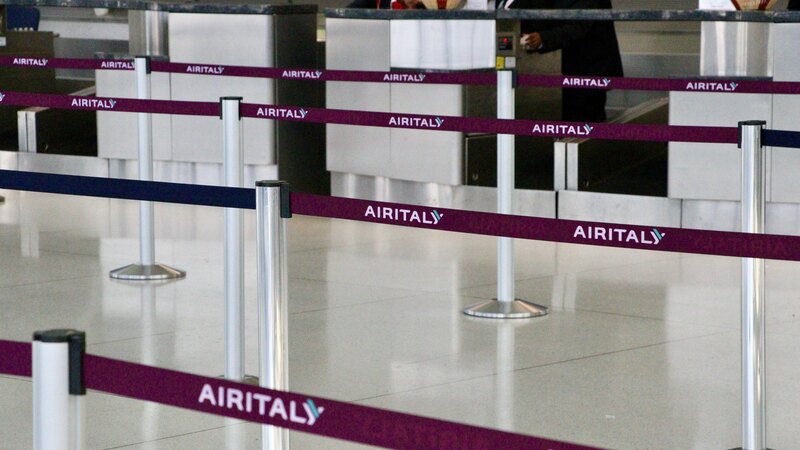 By acting as a disruptor on the route, Air Italy, and Qatar Airways by association, will be sending a message to both carriers that they’re ready to go head-to-head and show customers that there’s a new, better way to travel to Italy. In addition to the two foreign carriers, American Airlines and Delta Air Lines also operate service between the two cities on Boeing 777-200 and Airbus A330 aircraft, respectively. Though it’s too early to tell whether the joint venture between Qatar Airways and Alisarda will be a success, it’s definitely a new age in Italian aviation.